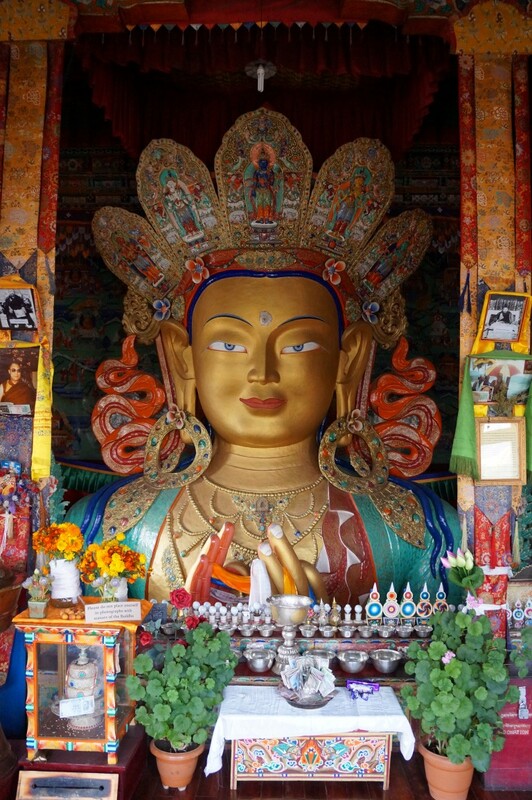 In Ladakh, Tibetan culture is colourful and thriving. 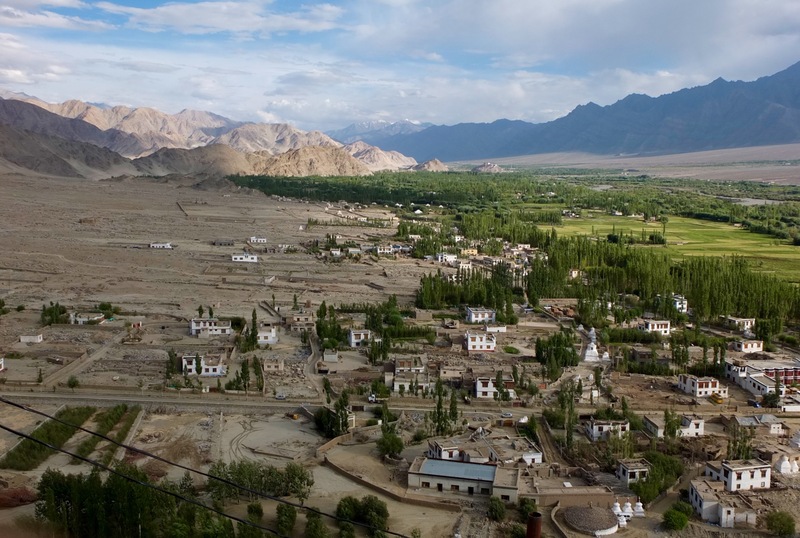 During the cultural Revolution in China in the 1960s and ’70s, Buddhist culture in Tibet experience a massacre – 1000 year old scriptures burned, monasteries reduced to rubble. 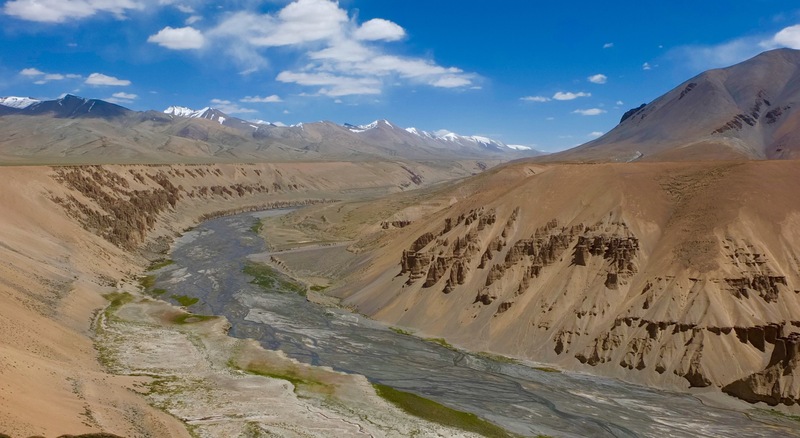 Because the provinces of Ladakh and Spiti remained a part of the Indian union, Tibetan buddhism in this region remained protected. 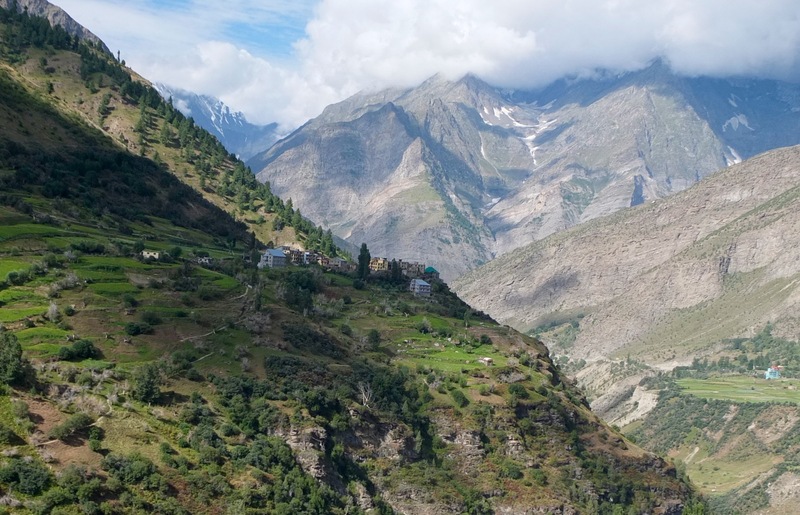 As a result, this extraordinary part of India has monasteries that have been untouched and preserved for up to a thousand years. 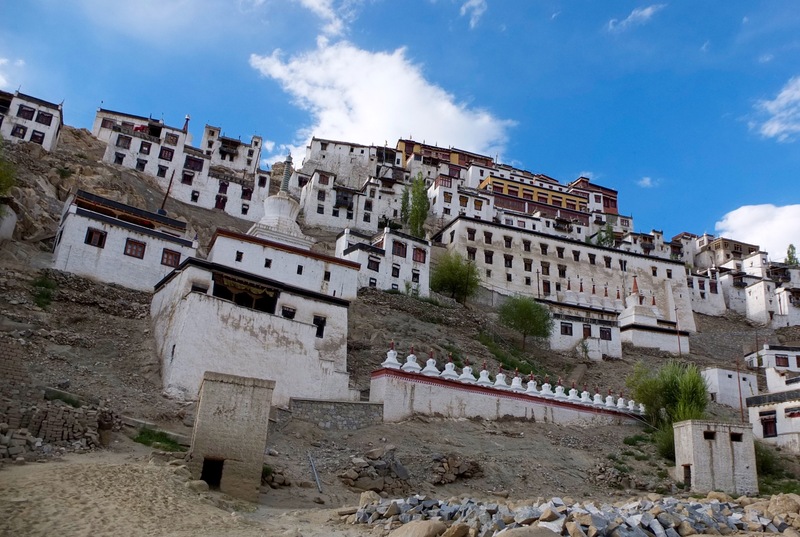 Thikse gompa was an impressive sight. We climbed to the top, from where we had amazing view of the valley and mountains in the distance. Inside of the rooms were fascinating statues including a gigantic gold Buddha. Inside of a temple there was one terrifying statue of a god (I think?) that had many arms. Supposedly this creature represented anger and sometimes the emotion would become so intense that it would consume itself. Leaving the temple, we later camped at the base of what looked like an abandoned shrine. 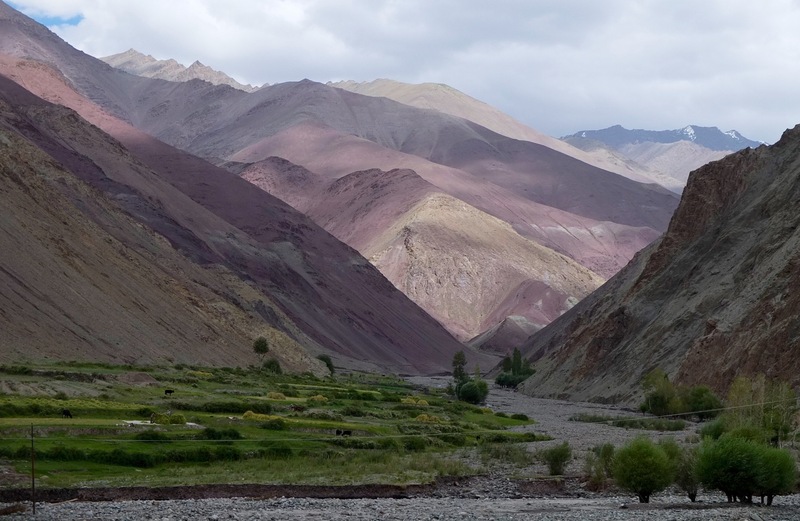 Barren mountains surrounded us, defined by the shadows being cast from the fading light. I slept well that night, hoping to feel more energetic the next day. I woke up the next morning feeling worse that the previous day. I knew from experience that it wasn’t altitude sickness, but my stomach and it continued to protest. 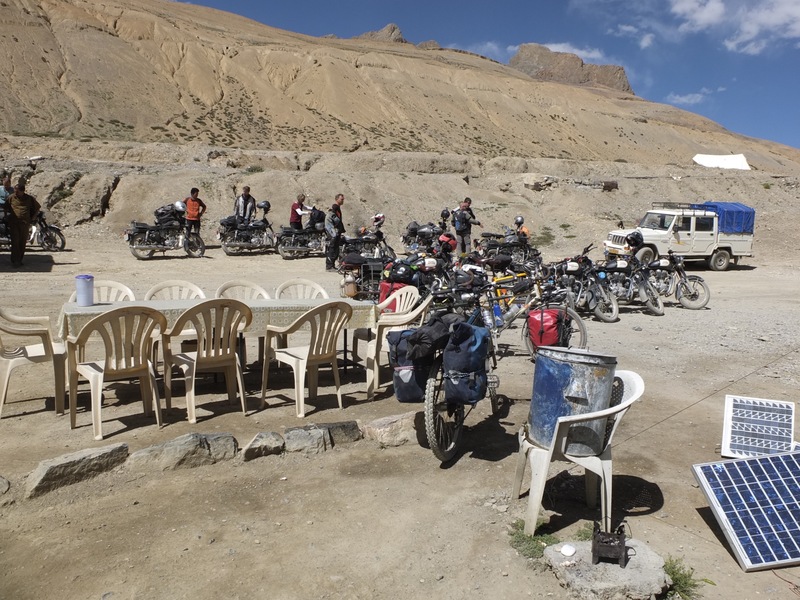 On the way to Lato, we stopped at a small Tibetan restaurant. I asked for tsampa – a popular Tibetan breakfast of ground roasted barley. It wasn’t on the menu, but the owner dug through some cupboards, coming out with a large bag. I asked for milk, hot water and sugar to have with it. While I thought this was a safe meal, sure enough my guts paid for it again later. 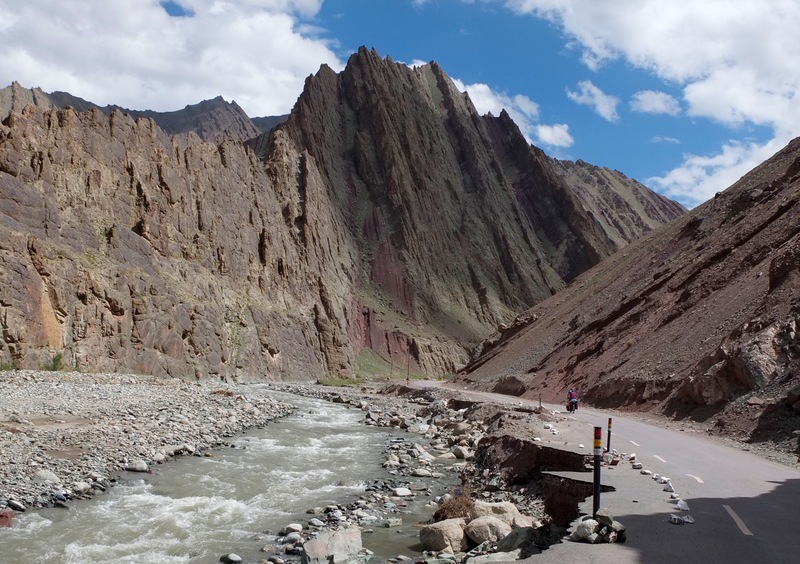 The road carved its way along a beautiful river valley surrounded by wild, jagged rock faces and coloured rocks. Small Tibetan style houses were spread out along the river. We reached Lato, barely a town with a few guesthouses and gorgeous areas to camp. We decided to stop here for the night and had a wonderful campsite. The stars that night were something of dreams. The three of us sat outside of our tents gazing intently at the clear streak of milky way, awestruck. The experience of a Himalayan night sky – the silence and the billion tiny balls of light against the darkness cradled by the mountains is unforgettable. We ended spending two extra days in Lato, which really wasn’t such a bad place to be stuck. Kirsty had a worrisome headache the first day and we had decided to play it safe. 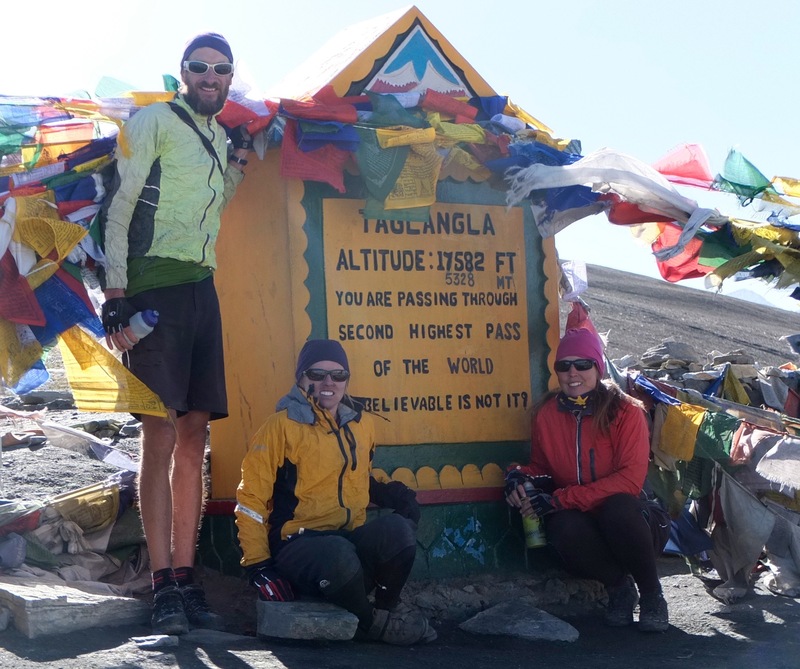 We knew that once we had crossed the Taglang La we wouldn’t be descending much below 4000m. If you got altitude sickness, the only way to get to a lower elevation would be to go back the way we had come or over another high pass in the other direction. In Lato we ate our meals at a cozy little guesthouse where we had Tibetan noodle soup called thukpa, along with the staple of dal and rice. 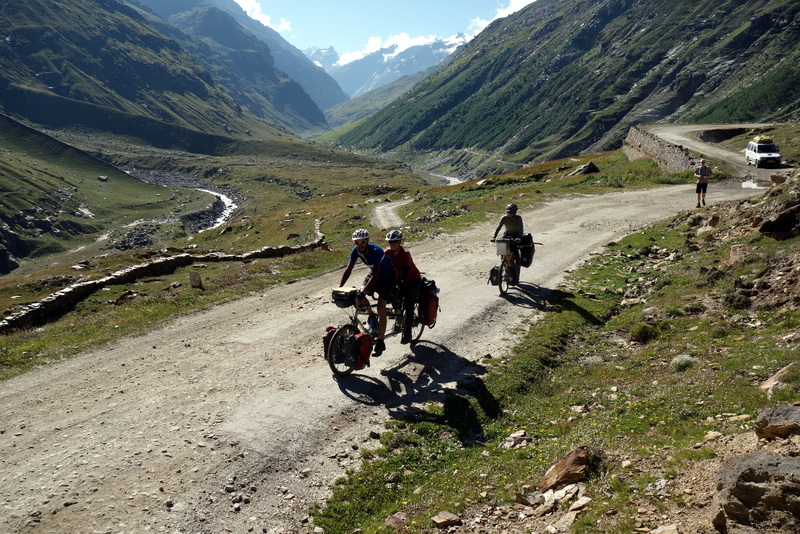 There, we met another Scottish couple touring on a tandem, along with some Polish backpackers who had some panniers made out of cheap school backpacks to go with the bikes they had picked up in Delhi. 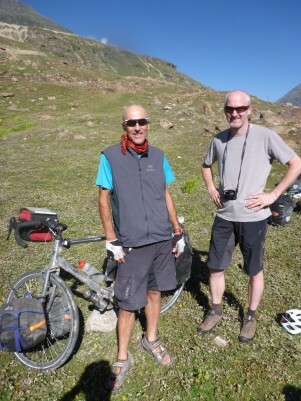 It was their first bicycle tour and they were doing remarkably well considering the difficulty of the route. 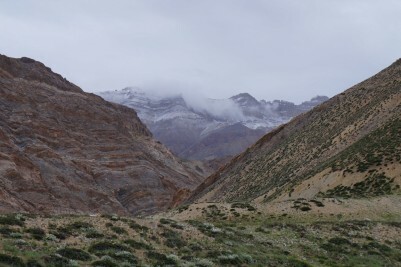 The day we had planned to leave the guesthouse it was raining like crazy – a horrible cold rain and we could see that the Taglang la was shrouded in cloud. 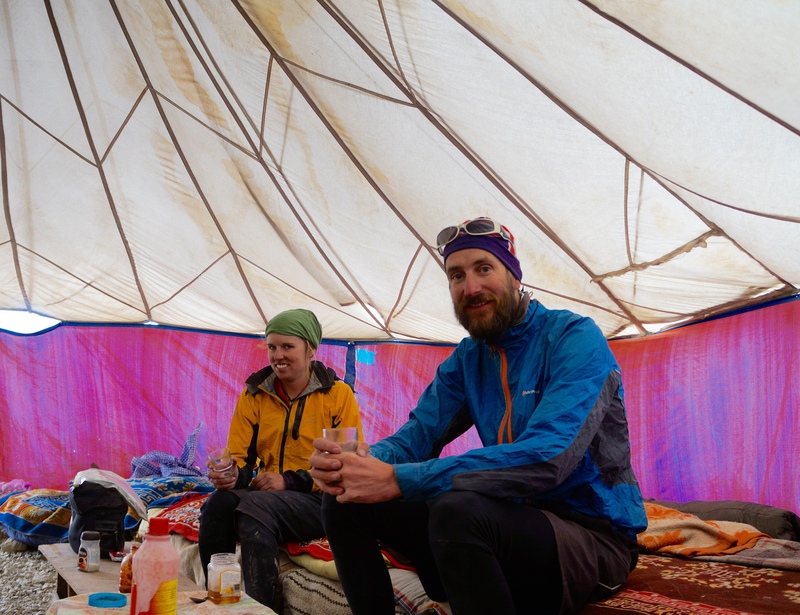 We decided that it wasn’t the most ideal weather for trying to climb a 5000m pass and ended up waiting one extra day. Finally, the day came. We left Lato and headed towards the Taglang la. The weather was perfect and clear. From Lato the road continued to climb and climb. We got many thumbs up from passing motorbikes. 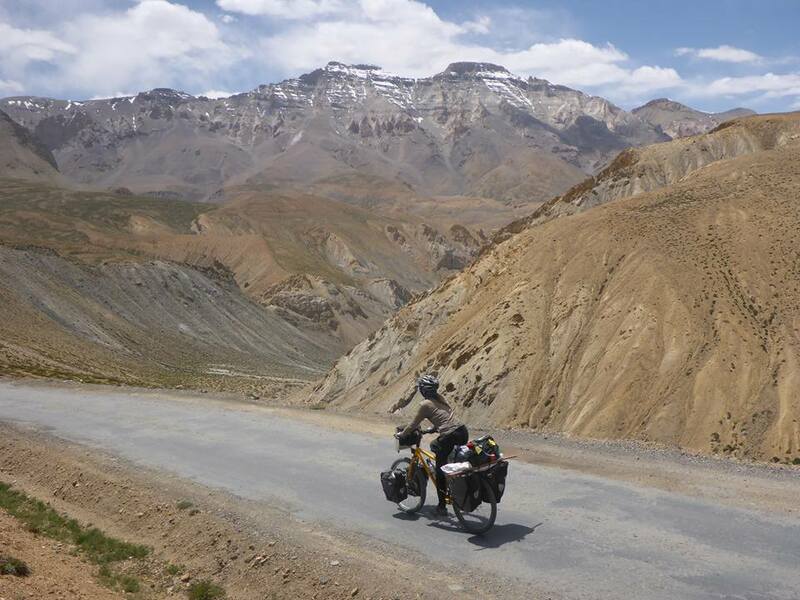 I had seen more motorcyclists on this route than any country I had previously visited. Many were riding Royal Enfields, part of the legacy left by the British. 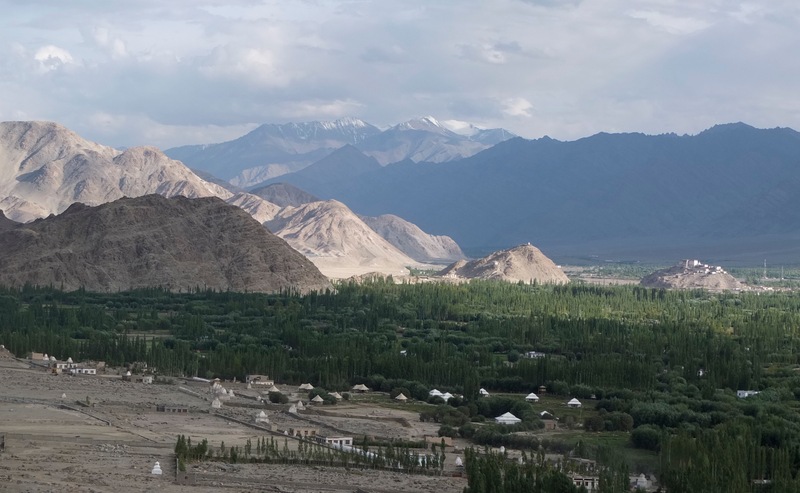 Passing a small town about 8km from Lato called Rumptse I suddenly felt transported back to Tibet with the high altitude desert scenery all around and white washed houses. 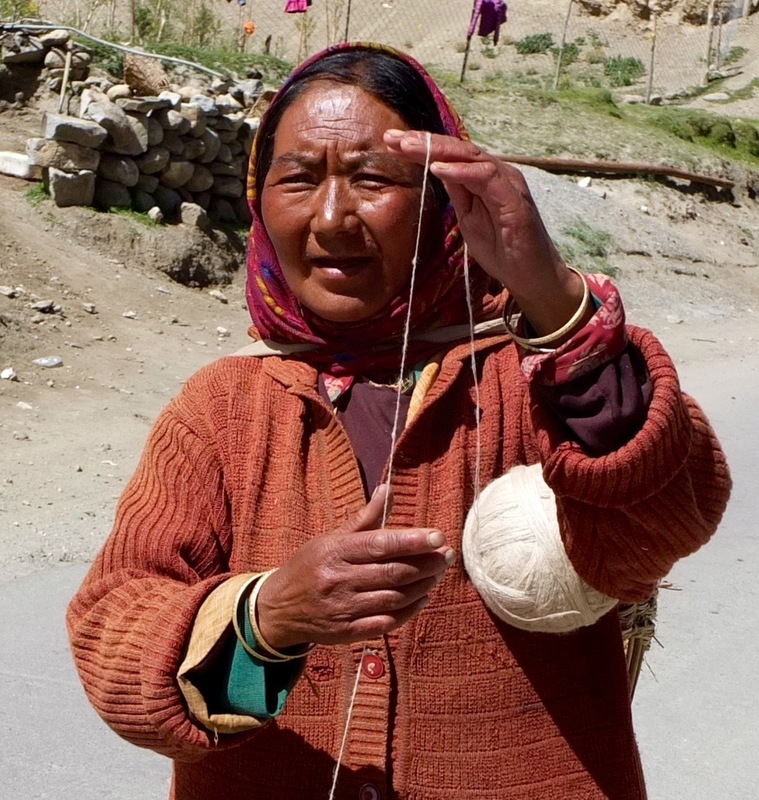 We passed a Ladakh women walking around spinning Pashmina by hand. As the air grew thinner, I started to adopt my high altitude breathing pattern of two quick breaths in, two quick breaths out. 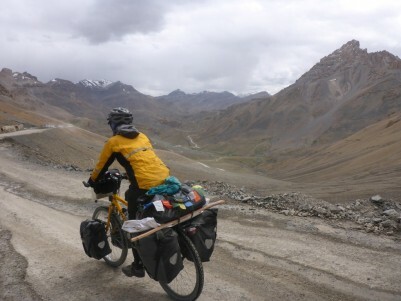 I had cycled over 5000m before, but this was with a support van in Tibet and I wasn’t carrying any of my own gear. With 35kg, it was a challenge. Once you get over 5000m, sometimes you can feel like you are barely holding on. And that’s how we felt. The headaches crept in and I felt so fatigued that I could barely think. There was an ultramarathon race taking place on this route (yes, seriously) and we met one of the support cars on the way up, but no runners. Since it was the end of the race the guy had all sorts of supplies to offer us – Snickers bars, peanut butter and a kilogram of sports energy drink. During this whole interaction I felt so out of it that I couldn’t even get excited over free peanut butter. I could barely get out sentences and felt like I was drunk. This is what high altitude does to you. If not taken seriously, it can be dangerous. But we would eventually descend low enough that it wouldn’t be an issue. The last 10km were hell. The last 500m felt like 500km. Then, the prayer flags! This time I didn’t get the usual excitement and surge of energy. I felt like I barely made it. Kirsty and Marcus were a bit ahead and I eventually caught up. We were all beyond wiped from the climb. We were almost too tired to appreciate the stunning scenery all around. 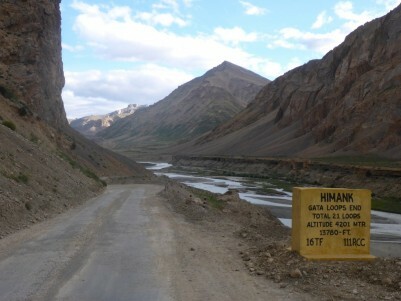 At the top there is a sign claiming that the Taglang la is the 2nd highest motorable pass in the world. 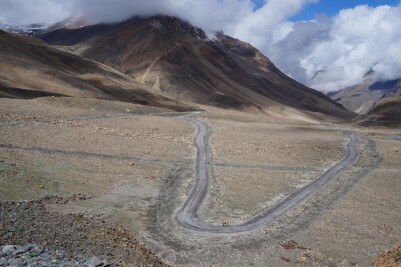 Supposedly the highest is the Khardung La Northeast of Leh at 5359m, with an incorrect sign at the summit saying it is 5602m. 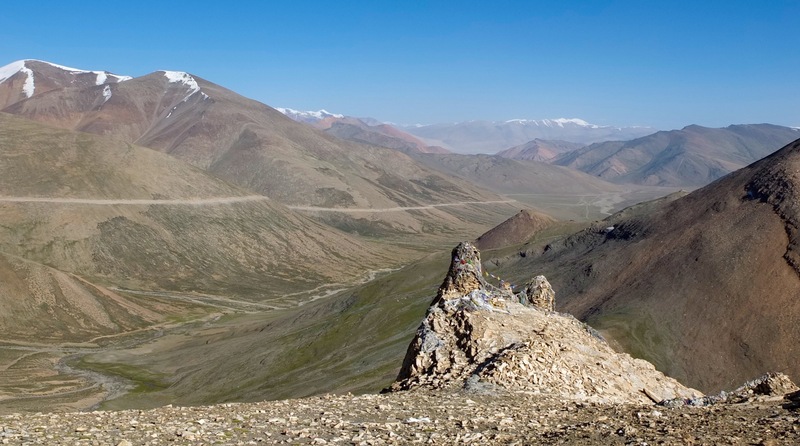 These are dubious claims as there are some roads in Tibet that are supposedly higher. 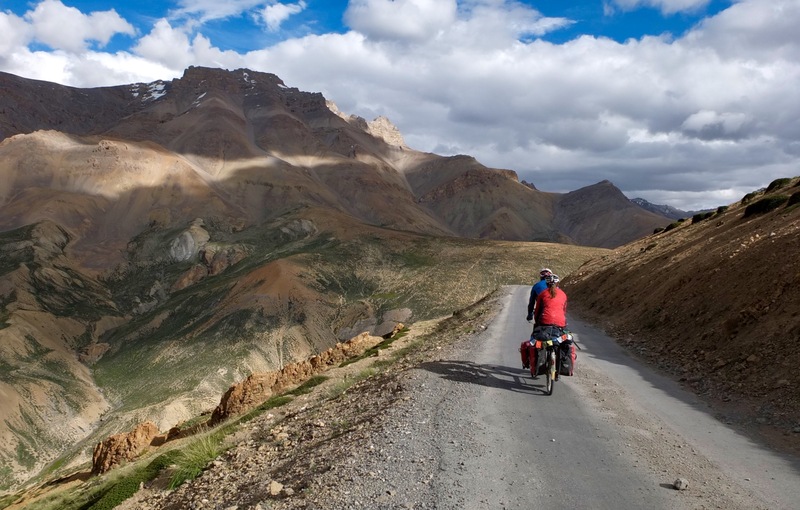 One of the greatest rewards of a strenuous climb is the exhilarating descent on the other side. 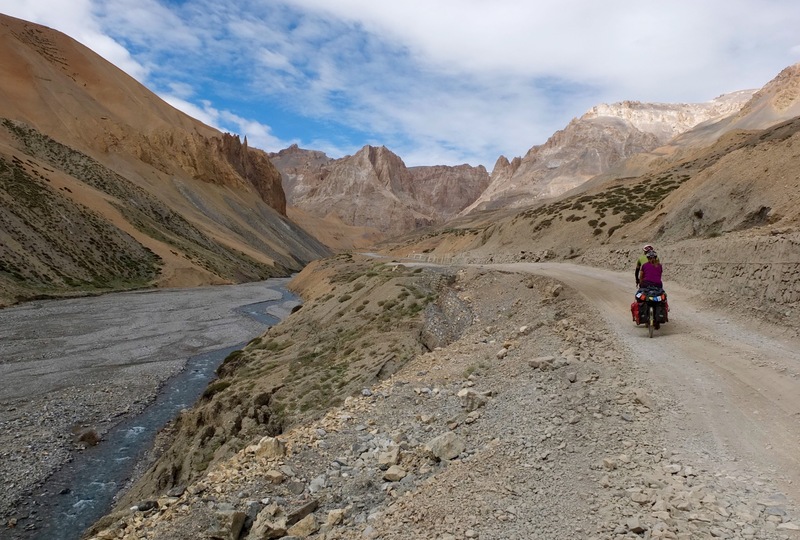 Well, the descent from the Taglang La was far from it – slow and rough. With all of the rattling, I wonder for a crazy moment if the climbing was less torturous. Eventually, we reached Debring – a small “village” of parachute tents. 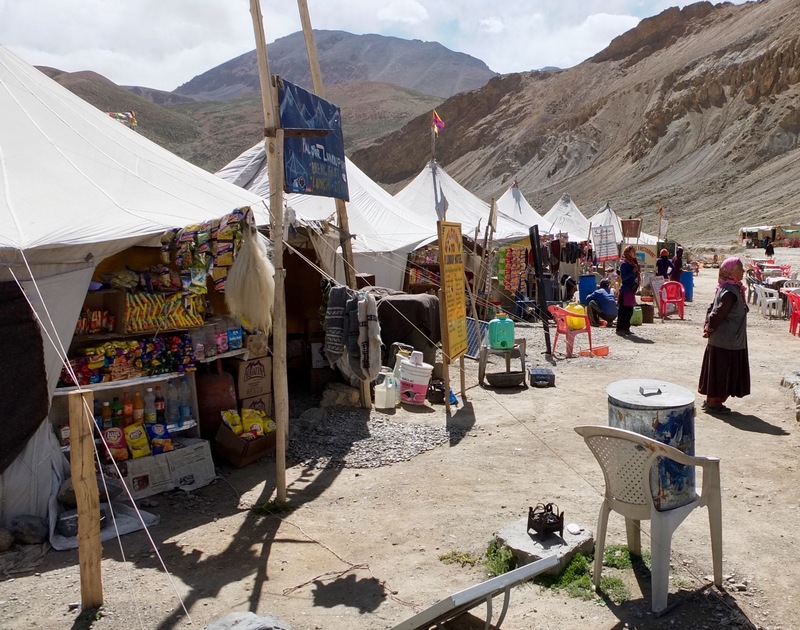 All along the Manali to Leh highway are temporary settlements consisting solely of these parachute tents. Inside, they offer basic bedding and food. They are around usually from late June to mid October before the harsh winter arrives and the highway is closed until the following summer. 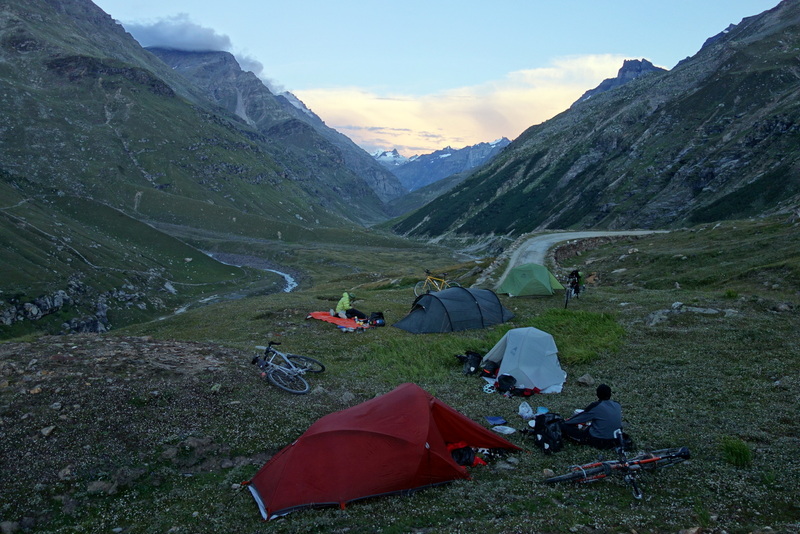 In Debring, we decided to camp by a lake and had a dinner of momos (Tibetan style dumplings) noodle soup and omelettes. 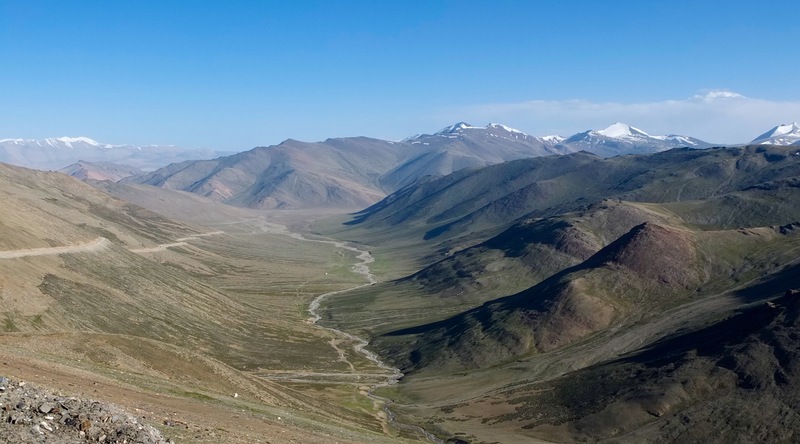 The next morning I felt so exhausted from the previous day that I could barely cover the 40 something kilometeres across the flat Morei plains to Pang. But the stark and beautiful scenery helped to ignite the senses and give me enough energy to pull through. 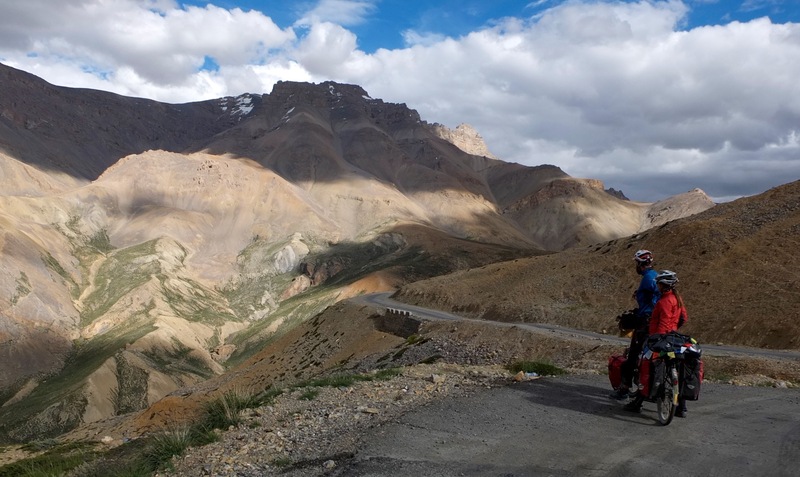 I was beginning to understand more and more why the Manali to Leh highway is considered one of the best rides in the world. 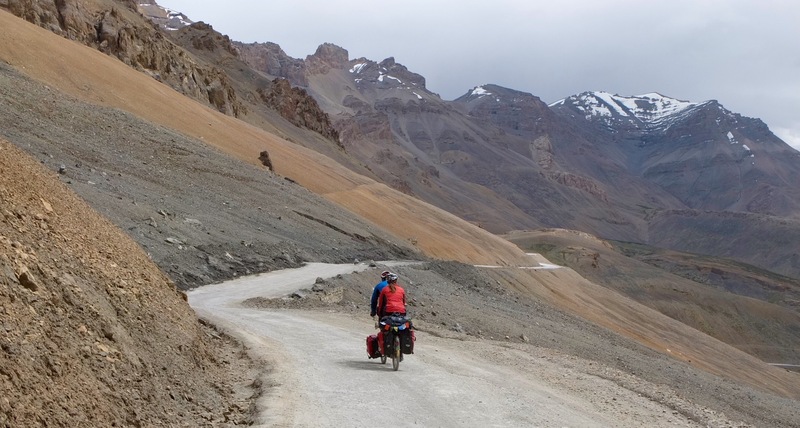 The one drawback, however, was the amount of truck traffic on the road – more than I had expected. Also, the obsession with honking. 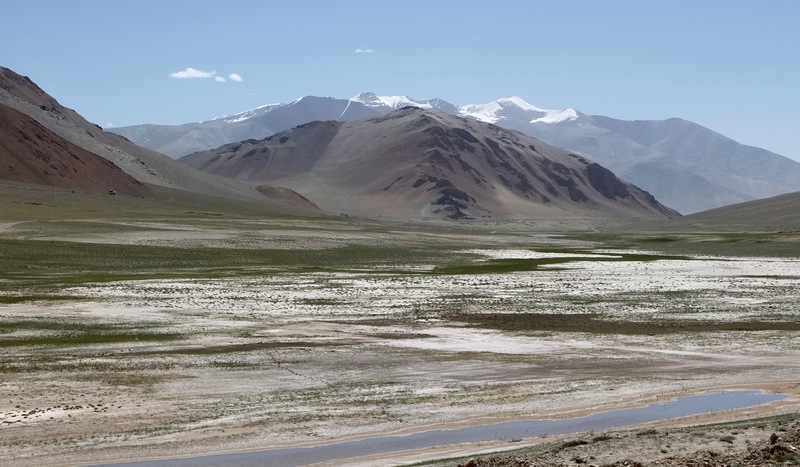 But crossing the vast Morei plains there were barely any vehicles at all. 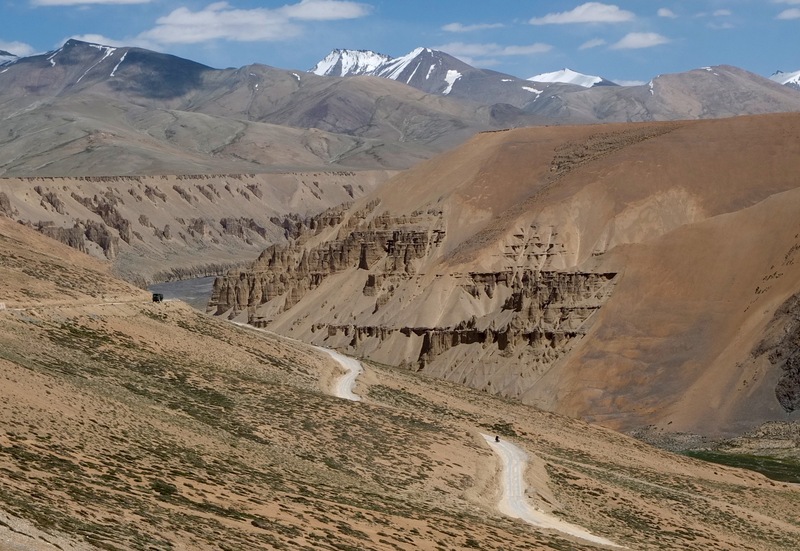 Then, just before Pang, we came to a stunning river gorge lined with hoodoos. The town of Pang itself was quite filthy, but had a great parachute tent scene. Despite feeling terrible and low on energy, I still hadn’t lost my appetite! While Marcus and Kirsty were still battling sickness on and off themselves I was often ordering too much food and finishing theirs as well. We spent the afternoon hanging out in a parachute tent and ran into some young British cyclists that we had met earlier. They were fast and full of pep and were sensible to be carrying half of what I was. 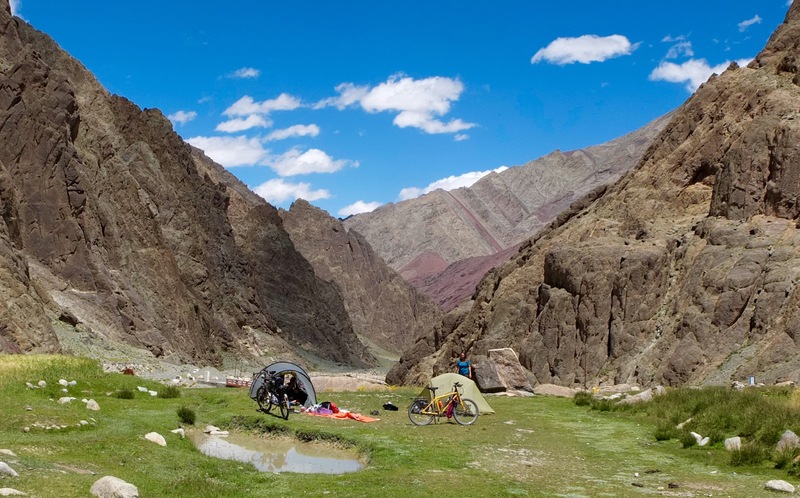 Outside of the tents were a few bicycles and many rows of motorbikes. The next day, my health had a complete turnaround. I felt incredible. I can sincerely say that this day was the highlight of the India tour so far (maybe even of my entire tour). The first pass of the day was the Lachlung La at 5077m. Then. at the start of the descent, my jaw dropped at the scenery ahead and stayed like this for the rest of the day. 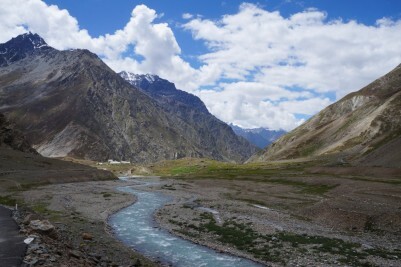 After a brief stop in a tent dhaba in Whiskey Nallah for some of our beloved ginger lemon and honey tea, we set out to climb the next pass, the Nakee La. 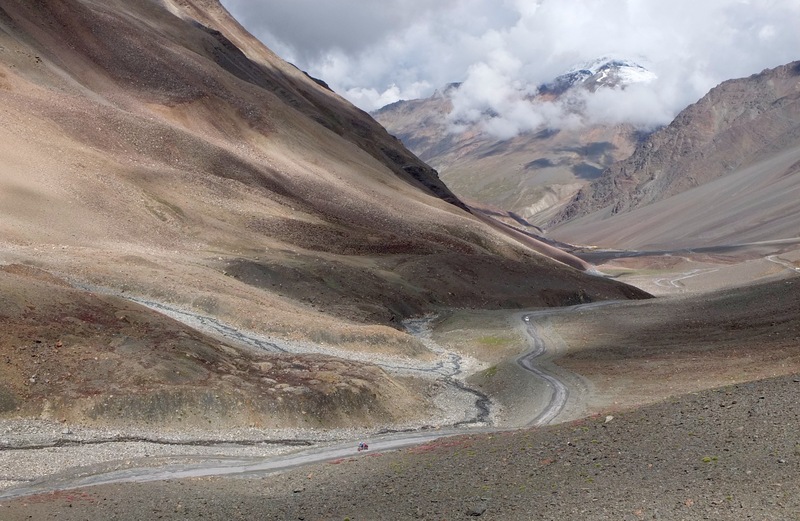 After the pass, another treat lay ahead – the famous Gata Loops, which are 21 switchbacks. We were lucky enough to be descending them. Before we reached this point, we zoomed downhill through more epic landscape. It set my heart racing and I felt so tiny and overwhelmed in its presence. 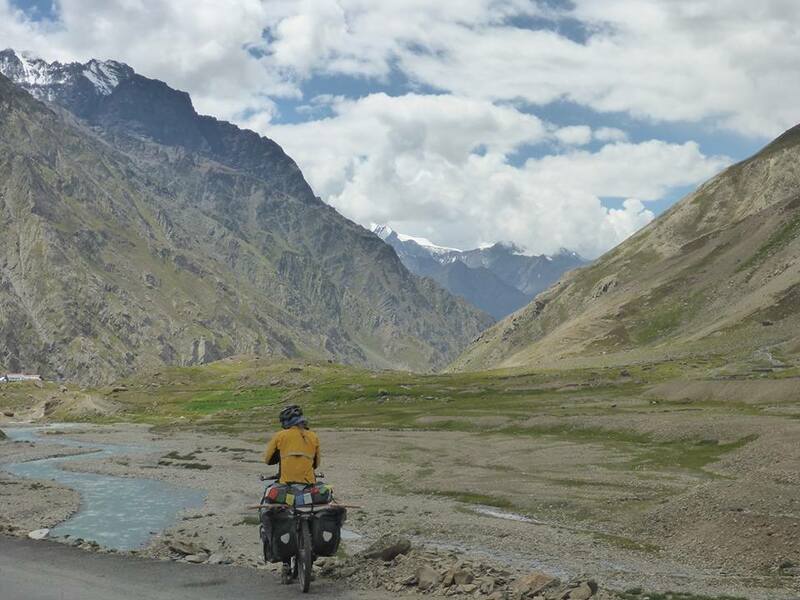 I thought to myself, this is why I bike tour and this is when I feel the most alive. 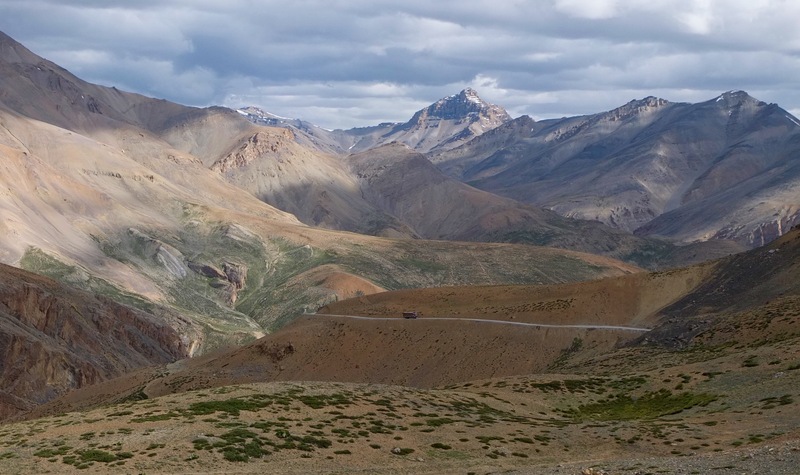 Racing down the Gata Loops was a lot of fun and from the top we had wonderful views of the river valley in the fading light. 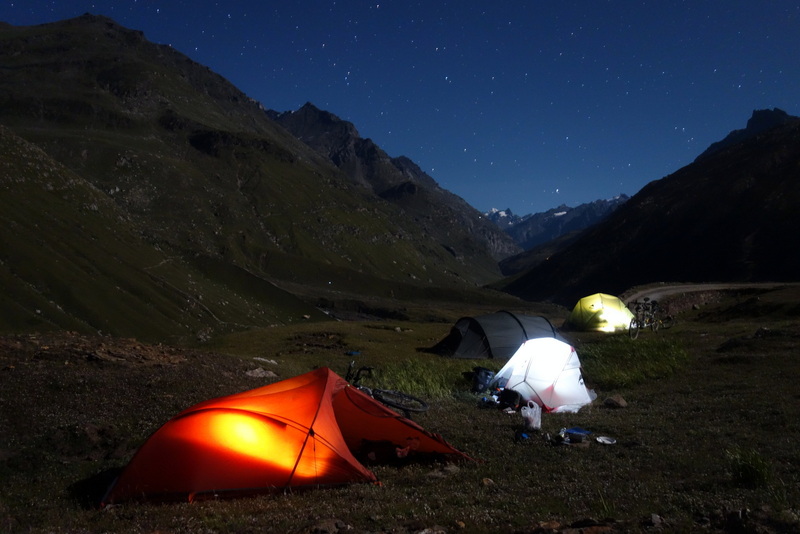 We camped that night and it was one of the best campsites we had in India so far (this was going to be topped in Spiti). The intense stars prolonged the magic of the day and I fell asleep with a deep satisfaction of what I had just experienced. The next day had a whole other character. 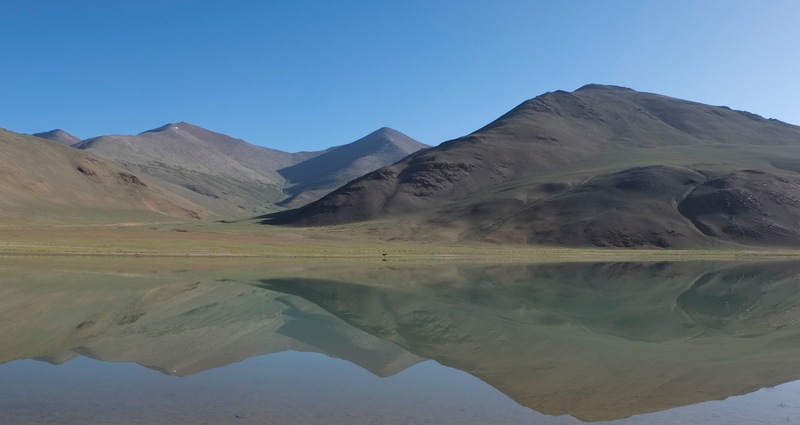 It did start off with an amazing 20km to Sarchu. We passed another beautiful river gorge with wonderfully textured mountains all around. 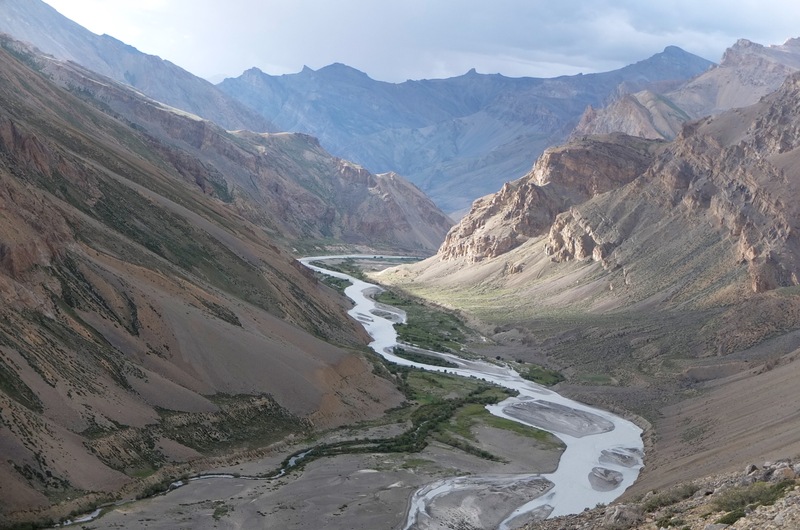 Really, I think I am running out of adjectives to describe Ladakh. 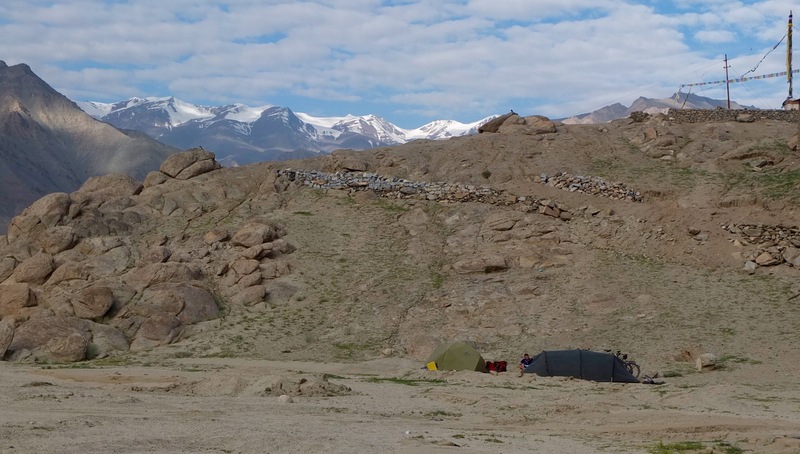 In Sarchu we had a second breakfast of our beloved Maggi instant noodles and an omelet. Maybe too many noodles for me. While Marcus and I felt fairly strong, Kirsty was still suffering from the sickness that I had finally managed to shake off. She had been on and off for a about a month and it was becoming concerning. 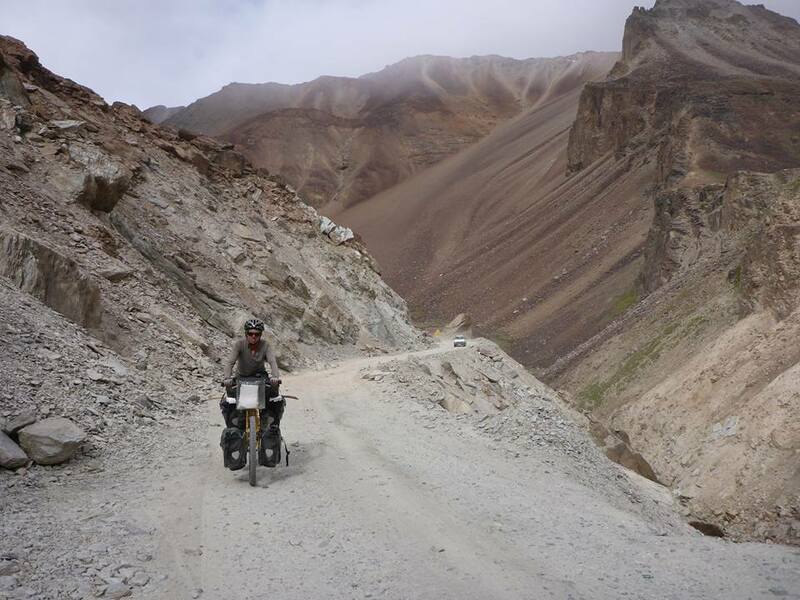 These roads were challenging enough in perfect health. 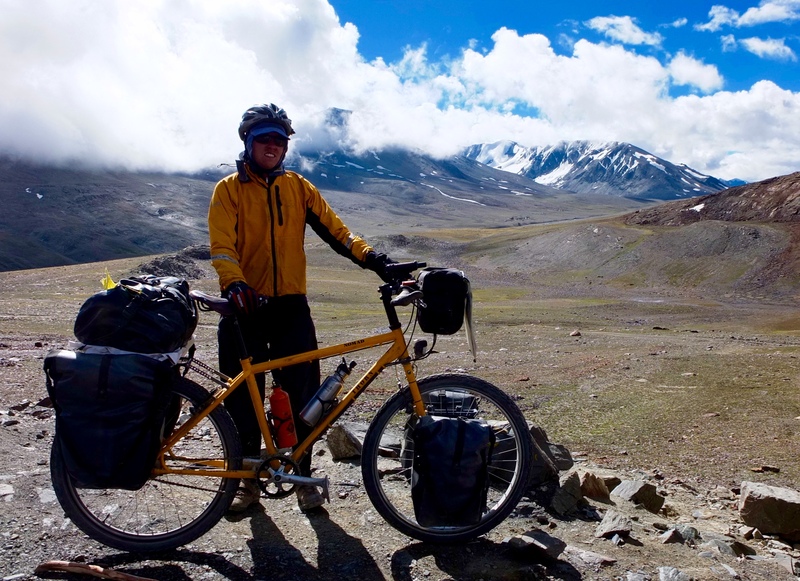 Leaving Sarchu, we cycled into a terrible headwind on a road that went from bad to worse. 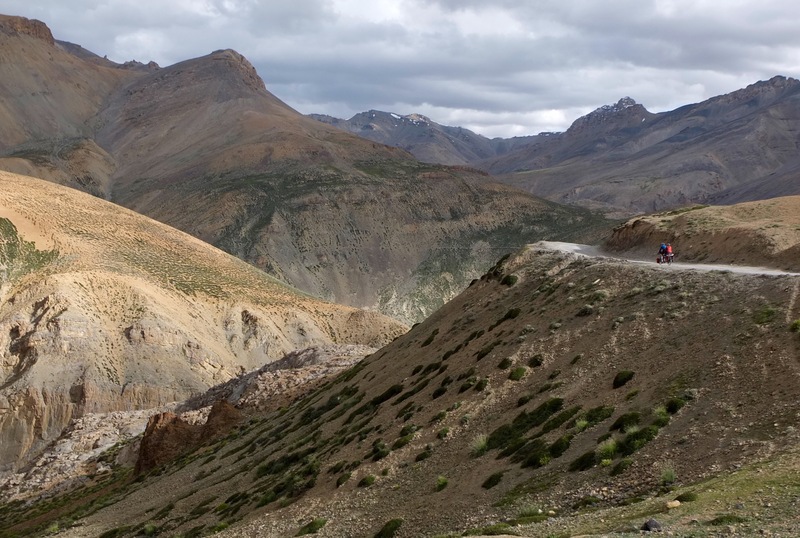 We had plans to cross the Baralacha la pass, but with the conditions this was becoming less and less of a reality. 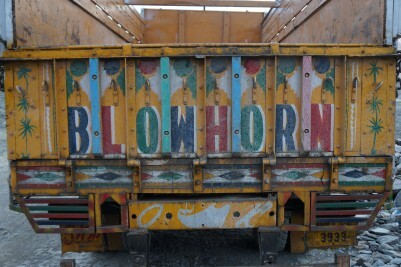 Today the truck traffic was especially heavy, sometimes with barely enough room for two to get by on the perilous roads. We ran into a traffic jam that was almost comical – two trucks on each side of a blind corner high on a cliff driving almost side by side, towards one another and then trying to pass. When they came to a standstill, we said “have fun with that one guys” and snuck by with clearly the vehicle of choice in an absurd situation. 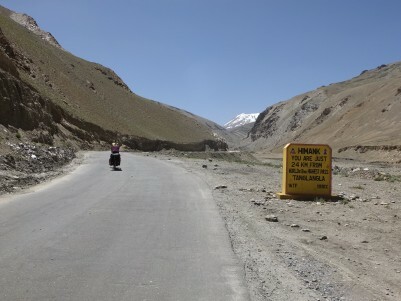 The road was really terrible – lots of loose rocks. 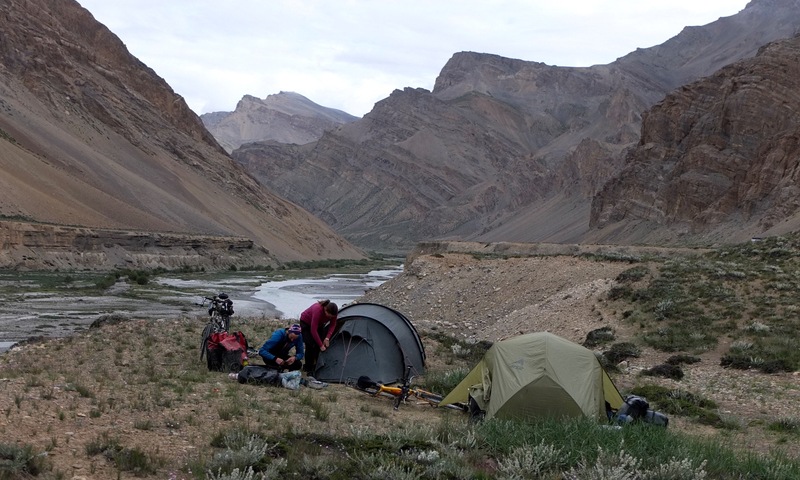 We knew there was a parachute tent village called Bharatpur just below the Baralacha la and we decided we would spend the night there. A cold and unpleasant rain began and Bharatpur still seemed so far away as we were uncertain of the exact distance. We were thrilled to arrive and spent the night in a very cozy tent dhaba. This one was larger than usual with wood beams in more of a triangular house shape. We sat around the tables and wrapped ourselves in blankets, eating chips and drinking milky coffee. We didn’t move for about a hour. We didn’t regret our decision as the weather turned frigid. We met some freezing Italian motorbikers that said it was snowing on the pass. Clearly we made the right decision to stop! We slept in the main restaurant with bedding and about 3 huge blankets each. After dinner, I dozed off with an Indian version of American Idol playing on the TV in the background. Morning. 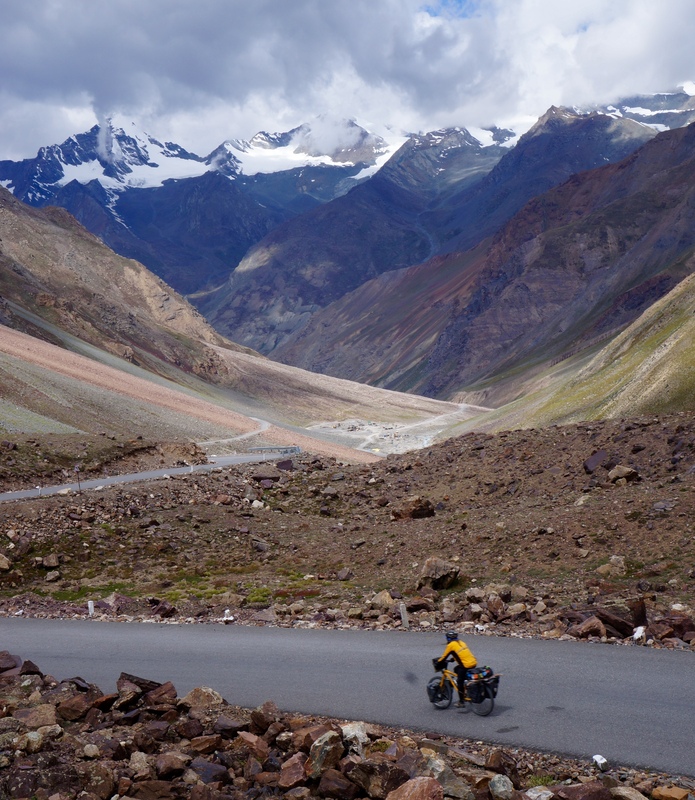 Time to ride the last pass on the Manali to Leh highway. The weather had improved significantly, but it was still quite cold. We loaded up on omlettes and pranthas (a tasty, thick fried Indian flatbread) and set off. 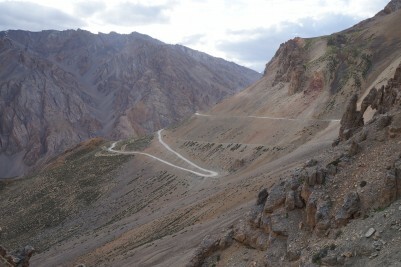 The road was still in terrible condition, with lots of short steep climbs that winded us. 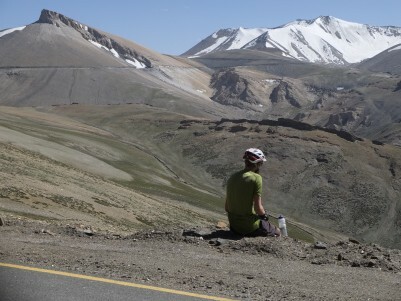 We reached the top of the Baralacha la at 4890m and then had about 60km of descending. It was cold, so we stopped a lot for photos. As usual, the scenery was mind blowing. The landscape grew greener and greener the more we descended. Suddenly it felt like a different world. 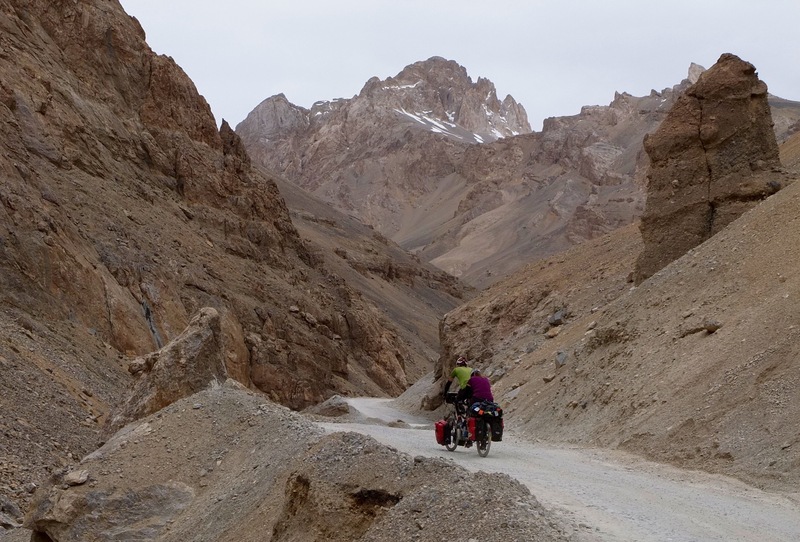 We made it to Keylong that night – an 85km ride, which was the longest we had ridden in a while. We found a budget hotel, that suddenly felt way too fancy with fast wi-fi. Kirsty and I indulged that night in a delicious butter chicken dinner and Marcus with some kind of chili chicken. At this point, everyone had had their fill of dal and rice. 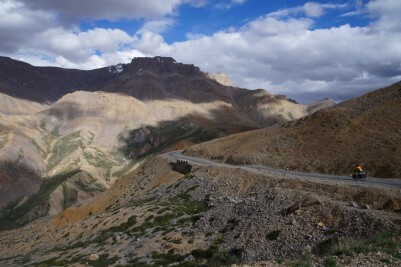 The road from Leh and left me completely amazed and I had heard equally great things about Spiti (aside from the disastrous roads). 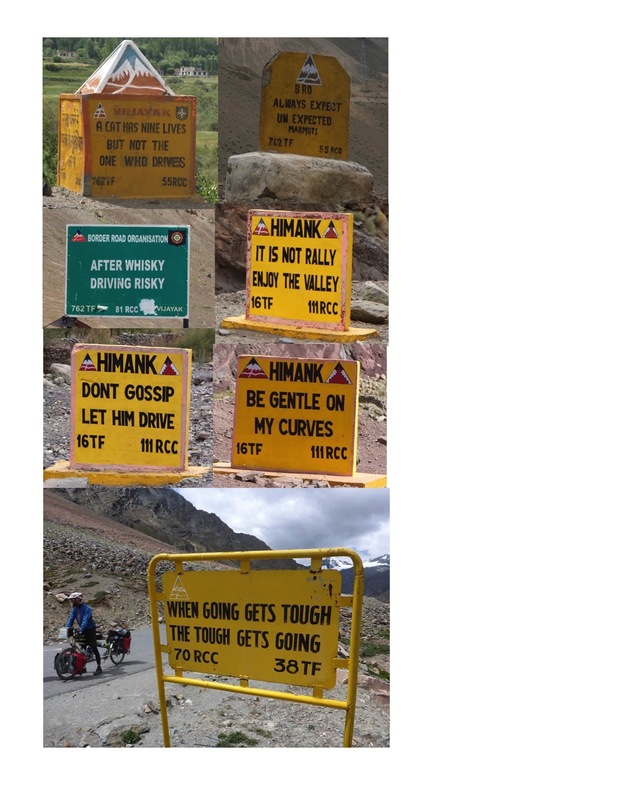 One of the highlights had also been the hilarious road signs that are an amusing characteristic of the Indian Himalaya. We would see them on a daily basis. Here are a few. Wonderful pictures! So am enjoying your posts! Wow!! This part of your trip seemed the most challenging so far. Beautiful pics! Stay safe my dear.